Newly designated OIC Assistant Regional Director Virgilio Eduarte (left) and OIC Samar First OIC District Engineer Alvin Ignacio. CALBAYOG CITY – By virtue of Special Order No. 61, Series of 2016 DPWH SFDEO District Engineer Virgilio C Eduarte is designated as the new Officer-In-Charge Assistant Regional Director of DPWH Region VIII. Signed by DPWH Secretary Rogelio L. Singzon, SO 61 directs Engr. Eduarte to perform the duties and assume the responsibilities appurtenant to the position of ARD. This position is previously held by Engr. Edgar B. Tabacon who is now designated as OIC Regional Director by virtue of Special Order No. 60, Series of 2016. Engr. Eduarte started as a C/M Foreman for DEO of Quezon City while taking his second undergraduate degree in 1991. Since then, he went through different positions in DPWH. On January 17, 2006 he was designated as the OIC-District Engineer for DPWH-SFDEO, Calbayog City where he held the office for almost three years before he was promoted to the position of District Engineer of Samar I on August 20, 2008. Another SFDEO head designated to a new position is Assistant District Engineer Alvin A. Ignacio. With the reassignment of DE Eduarte as OIC-ARD, incumbent DPWH-SFDEO ADE Alvin A. Ignacio is designated as Officer-In-Charge for the office of the District Engineer of the same DEO by virtue of Special Order No. 62, series of 2016. SO 62 directs Engr. Ignacio to perform the duties and assume the responsibilities appurtenant to the position of District Engineer. Engr. Loreto M. Cedro will then assume as SFDEOs’ OIC-ADE by virtue of Special Order No. 63, Series of 2016. Engr. Ignacio has been with DPWH since February 01, 1990. He started as a Civil Engineer Aide before he got the position of Engineer II on January 01, 1991. He was promoted to Engineer III position eighteen years after and had held the position for almost four years before he was finally promoted to Assistant District Engineer on March 26, 2013. All resolutions were signed on May 18, 2016 and took effect immediately. NAVAL, Biliran – Although the district encountered a little delayed in the implementation of some school building projects in the Province, the Department of Public Works and Highways (DPWH) - Biliran District Engineering Office (BDEO) is rushing the completion of the remaining School Building Projects for the full implementation of the K-12 Program of the Department of Education (DepEd). District Engineer, David P. Adongay Jr. said that they have incurred delay due to the late release of result of sub-soil exploration test on some school sites and the additional works undertaken by the contractors on excavation of structures. “Most of the contractors met difficulty on excavation of structures as they encountered big rocks causing delay on the projects,” explained Adongay. Out of 30 school building projects under the different batches of the DepEd’s Basic Educational Facilities Fund (BEEF), 11 are already completed, 15 are on-going and 4 are not yet started which posts 59.25% of its project accomplishment as of May 31, 2016. “The solution is to advise contractors to render overtime work even during night time to meet our commitment to have this school buildings usable before the opening of classes while some others will be completed by the end of June”, said Adongay. In totality, there are 118 classrooms for Senior High School in 19 school sites, 31 classrooms in Elementary and Junior High School in 8 school sites and 3 Technical and Vocational Facilities/ Workshop in 3 Sites. Adongay disclosed that all school building projects will be completed more or less on the 1st week of July, 2016. Samar governor Sharee Ann Tan-Delos Santos while delivering her message during the Opening Ceremony of Candidate Soldier Classes - 419 & 420 - 2016 at 8ID Jungle Base, Brgy. Fatima, Hinabangan, Samar on June 1, 2016. CAMP LUKBAN, Catbalogan, Samar – Two Hundred Forty-Six (246) Candidate Soldiers took an impressive oath taking during the opening ceremony of PACSC Classes 419 & 420 - 2016 at the Jungle Base of 8th Infantry (Stormtroopers) Division, Brgy Fatima, Hinabangan Samar on June 1, 2016. The candidates, after passing through competitive Physical, Neurological, Psychological examinations, will undergo training which will prepare them for future role of performing duties in the Philippine Army. The ceremony was graced by Hon. Sharee Ann Tan-Delos Santos, Governor of Samar, as the Guest of Honor and Speaker with Maj. Gen. Jet B Velarmino AFP, Commander, 8ID, as the military host. Col. Cesar M Idio, Assistant Division Commander, 8ID, Division Staffs and parents of the new breed of soldiers were also present at the said occasion. Gov. Sharee Ann Tan-Delos Santos mentioned in her speech, “The challenge is just about to begin for these chosen few and valiant men we have with us today. I am also honored to be with the parents, relatives and friends of these Candidate Soldiers for with their support, they have entrusted the lives of their sons to be trained by the Stormtroopers and transform them into men, equipped with necessary skills in making them capable of defending and serving the people of Eastern Visayas”. Further she expressed her gratitude to Maj. Gen. Jet B Velarmino for the unwavering commitment in pursuit to peace and development in the province of Samar. Maj. Gen. Jet B Velarmino AFP, in his message to the trainees, “A career in the military is unique, challenging and physically demanding.” He subsequently thanked Gov. Tan-Delos Santos for being an active partner to the 8ID’s initiatives and highly regarded as part of the team 8ID. “Your Philippine Army at all times adheres on its mandate as a human rights advocate, peace builders and partner in nation building in the Region-8,” Maj. Gen. Velarmino added. 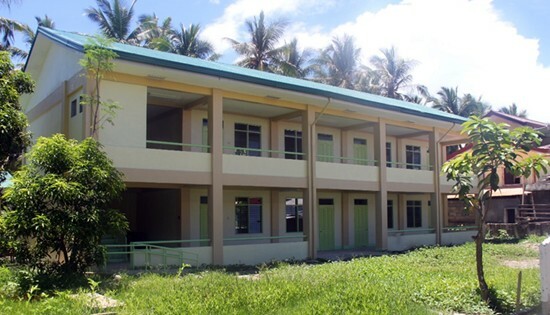 Completed two (2) storey-four (4) classroom school bldg., Trinidad NHS Tomaligues Annex School, Calbayog City, Samar. CALBAYOG CITY – Four weeks before School Year 2016-2017 starts, Department of Public Works and Highways - Samar First District Engineering Office (DPWH-SFDEO), released the status report of the infra projects under FY 2015 Basic Educational Facilities Fund (BEFF). Based on the report dated May 15, 2016, 28 out of the 105 school building projects were completed. This includes 19 school buildings in Calbayog Division and 9 school buildings in Samar Division. 57 SBPs are still on-going averaging to 67.05% physical accomplishment. 43 out of these on-going projects are in Samar Division and 14 are in Calbayog Division. Due to the projects location which could bring forth unforeseen damage to the equipment and construction personnel, triple handling of materials and the difficulty of transporting the same to the site, 14 SBPs were returned to the Department of Education comprising 8 SBPs in Samar Division and 6 SBPs in Calbayog Division. In Samar Division, 5 SBPs were awaiting for the approval of the modification of materials. Should the request be denied, these projects will then be returned to Samar Division due to hitches in the handling of materials and difficulty of transporting the same to the site. 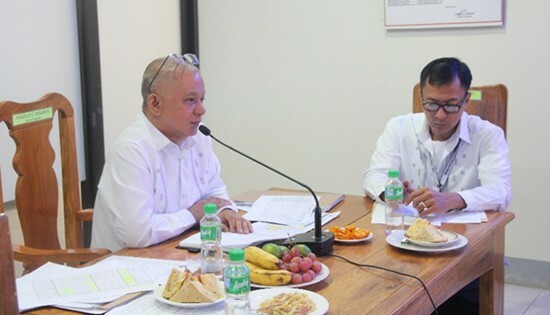 With the full swing implementation of the K+12 Curriculum, DE Virgilio Eduarte, ADE Alvin Ignacio together with the concerned section chiefs will continue monitoring these SBPs to ensure prompt accomplishment of these projects in answer to classroom shortage. Real Scientific Hemp Oil (RSHO) Cannabidiol (CBD) Hemp Oil demand grows as countries including Brazil, Mexico, Puerto Rico and Paraguay authorize its import from the U.S.
SAN DIEGO, CA – Medical Marijuana, Inc. (OTC PINK: MJNA) is pleased to announce that its flagship product Real Scientific Hemp Oil (RSHO) has been authorized by Paraguay's government for import into the country as a prescription medication for refractory epilepsy. Paraguay's first-ever import permit for RSHO marks the fourth country in Latin America, after Brazil, Puerto Rico, and Mexico, to approve MJNA's cannabidiol (CBD) hemp oil for indications including epilepsy, Parkinson's disease, chronic pain, and cancer. The first shipment of RSHO into Paraguay was authorized for 15-year-old Mathias Alejandro Gonzalez, who was diagnosed with an autism spectrum disorder and suffers from Lennox-Gastaut Syndrome (LGS), a rare type of epilepsy that doesn't respond well to seizure medications. "We are extremely proud of the wonderful news that RSHO has been approved for import by the government of Paraguay," states Dr. Stuart Titus, Chief Executive Officer of Medical Marijuana, Inc. "In the U.S., we enjoy the ability to easily access RSHO(tm) and many other CBD hemp oil products online. However, in other countries, we must respect their regulations and handling of cannabis-based products including hemp." "MJNA is a 'Company of Firsts'," Titus continues. "It took many years to establish and streamline a standardized commercial system while developing the world's first CBD hemp oil pipeline. We are extremely grateful to our investors who also saw and continue to see the vision of CBD hemp oil access in the U.S. and around the world." In February of 2015, HempMedsÂ® received authorization to export Real Scientific Hemp Oil-X (RSHO-X) to individuals in Mexico with government-issued import permits. Raul and Mayela Elizalde from the Por Grace Foundation, based in Mexico, helped explain their daughter Grace's need for the cannabidiol (CBD) hemp oil product for a case similar to that of Mathias Gonzalez's family in Paraguay – and were instrumental in the process of securing the permit. Since 2014, the government of Brazil continues to issue import permits for RSHO, as well as subsidize payments for the product under the federal government's healthcare system – and also waive import taxes. QUEZON CITY – Greenpeace welcomed the Climate Change Commission's (CCC) recently released Commission Resolution 2016-001, which calls for a "national policy review” of the country’s energy policy in order to reduce the country’s dependence on coal, implement a swift and just transition to renewable energy (RE), and pursue the development to a green economy. "This resolution is consistent with the Philippine commitment to contribute to the global effort to keep temperature to below 1.5 degrees, and a significant development in the face of the long standing demand by many communities and peoples organizations in the Philippines to shift away from coal energy,” commented Ian Rivera, the National Coordinator of the broadest climate justice coalition in the Philippines. The Philippines led the Climate Vulnerable Forum, a group of governments from 20 countries, in successfully pushing for the inclusion in the Paris climate agreement of the aspirational goal to limit global temperature rise to 1.5 degrees Celsius. “The urgency of addressing the climate crisis is deeply felt by our people, having experienced massive devastation from extreme weather events related to climate change, such as super typhoons and super-El Niños. It is only right that we lead in the effort to address change – not only in words but in action” said Rivera. “We hope this resolution will actually lead to the reversal of the Aquino government’s policy of expansion of coal energy, and a swift transition to renewable and clean energy for people and communities,” he added. "This resolution is long overdue. We have been fighting against coal plants and coal mines for a long time, being witness to the horrific effects of coal projects on communities, on people’s health and livelihoods, on our local environment. We are also against coal energy because it is one of the leading contributors to climate change" said Mr. Roldan Gonzales, Executive Director of Gitib, Inc., and a PMCJ campaigner from the Mindanao. “We challenge President-elect Duterte to take this further, beyond a review, and make it a priority of Presidency to issue an Executive Order suspending plans, permits and construction of new power plants in the country. Mindanao is host to many of the 27 new coal fired power plants currently in the pipeline“. Ms. Pines Arcega, convenor of Defend Zambales and a PMCJ anti-coal campaigner in one of the frontline communities from Luzon, echoed this challenge. “A review of energy policy and harmonization of regulations on new and existing coal plants is not enough. Our communities, our country, have suffered enough. Government should act immediately to put a stop to dirty energy. We need an executive order for a moratorium on new coal plans and coal mines in place in the first 100 days of the new administration. QUEZON CITY – Petitioners in the landmark human rights complaint against fossil fuel companies today submitted to the Commission on Human Rights of the Philippines (CHR) copies of their petition in compliance with CHR’s May 10 Order, which also enjoins the respondents to answer within 45 days upon receiving their copies. The petition, which CHR will send to the 47 top fossil fuel companies worldwide, seeks investigation into, and accountability of, these companies for climate impacts that endanger people’s lives and livelihoods, as well as that of future generations. “This is a big, bold step for the Philippines as it is at the forefront of climate impacts. But this courageous undertaking can only succeed with the unifying support of government agencies, communities, civil society organizations and other human rights institutions from all over the globe. Climate Justice is not the Philippines’ fight alone, the outcomes of this petition may mean a better life for countless souls, but we all have to do this together.” said Anna Abad, Climate Justice Campaigner of Greenpeace Southeast Asia.